A WWII U.S. intelligence report on a Japanese military signal lamp, from Tactical and Technical Trends, No. 51, October 1944. The Japanese Signal Lamp is a portable, lightweight field unit designed for point-to-point communication on the ground by means of a keyed light beam. It is powered by a hand-driven generator, weighing 13 pounds. The complete unit, less tripod and generator, is carried in a plywood case with metal edges the over-all dimensions of which are 10 3/4 x 8 1/4 x 5 3/4 inches. The unit weighs 10 pounds, including the carrying case. Aluminum is used extensively both in the lamp and accessories. The lamp and the carrying case are painted brown. The under side of the plywood case cover contains a manufacturer's nameplate and a list of parts. The principal parts are: signal lamp, lamp mount, shutter, telescope, two telescope filters (one red and one yellow), occluder, lamp filter case, three lamp filters (red, yellow, and blue), six lamp bulbs, lamp bulb box, key and cord, tripod, carrying case, generator (hand-driven), hand crank for generator, wrench. The lamp beam can be directed to a definite point of known elevation and azimuth by means of a tubular peep sight, an elevation scale, and an azimuth circle. The tubular peep sight is factory-aligned with respect to the beam and is fastened to the lamp housing by means of screws. The elevation scale is graduated in hundreds of mils from -1600 to +1600 although vertical travel is possible only between the limits of -1340 to +1360. The azimuth circle is graduated in hundreds of mils from 0 to 6,400, with five divisions of 20 mils each between numbers. There is evidently a telescope mounted on top of the lamp (the telescope was missing from several samples of the equipment examined, doubtless a sacrifice to souvenir hunters). It is apparently used to align the lamp and to aid in receiving messages flashed from a distant sending lamp. The maximum range of the lamp is estimated to be 5 miles on a clear day. The maximum signaling speed is four words per minute. A shutter over the face of the lamp varies the beam produced from a cross to a single dot in seven stages. The operator selects the desired shutter opening by moving the numbered slotted spring catch located on the face cover. The parabolic reflector has a face diameter of inches, is highly polished and is protected by a coating of clear lacquer. The bulb used is gas-filled and requires 2.5 amperes at 6.2 volts. It is focused by bringing the filament in line with two peepholes on the side of the signal lamp housing. The bulb socket is mounted on an adjustable horizontal arm inside the lamp housing to permit focusing. A. pivoted worm drive is used to disengage the gears for rapid rotation of the lamp. The same pivoted worm drive is used in the elevation arm for rapid vertical movement. 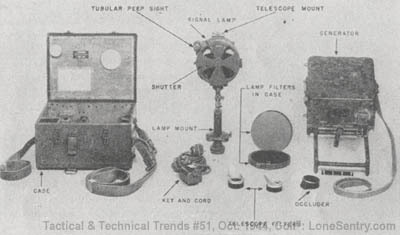 Japanese signal lamp and generator, unassembled, showing carrying case, lamp components (minus telescope and tripod) and generator. The electrical circuit of the lamp includes the resistance of the key and cord. It is inferior to that of the U.S. Signal Lamp Equipment EE-84 in which keying is accomplished in a local circuit, operated through relay contacts, that excludes the resistance of the line between the key and the relay from the lamp circuit. Electrical connections to the bulb assembly terminate in a two-pin female socket located on the side of the lamp housing. The generator and key are connected to this female socket by a length of two-conductor wire terminated in a two-pin male plug. The key is a simple make-and-break key encased in a wooden box. The hand generator is contained in a wooden case and is provided with a folding iron stand for operation from a sitting or kneeling position. The hand-crank motion is transmitted to the armature through a spur gear train and must be operated at 60 revolutions per minute in order to produce rated output capacity of 3.5 amperes at 6.5 volts. A cut-out shunts a load resistance across the output when the potential reaches standard voltage. To power the lamp, however, any 6-volt d-c source can be used. Four U.S. Signal Corps batteries BA-23 connected in series are recommended.